Bigun Eye the Buckley Mountain Feist—"My dogs are registered as Buckley Mountain Feists. They are registered in the Buckley Mountain Feist Registry. My ancestors have been breeding these dogs well over 100 years, with my granddad giving me my first dog at the age of 7. That was 52 years ago and I have been breeding them ever since. We now have 14 dogs and 7 puppies in our kennel. Over the years we have sold and gave 100's to others all over the USA. Our dogs are bred primarily for hunting. 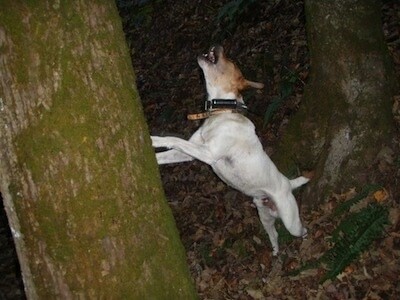 They are natural tree dogs and we use them mostly to tree and hunt squirrels. The majority of the Buckley Mountain Feists are natural retrievers and they will retrieve the squirrel right to their master’s hand after shot out. This makes them very demanding for hunting squirrels in the hills and mountain areas. But our dogs have an instinctive drive to chase any animal that climbs a tree and others use them for hunting raccoon." 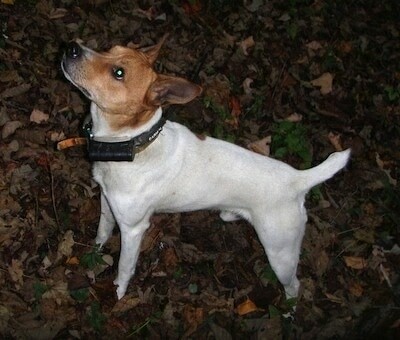 The Buckley Mountain Feist has short tight hair, prick ears with a natural doc or long tail. Even though the Buckley Mountain Feist was and is bred to hunt, it is a people dog that makes a great pet and is very good with children. Many Buckley Mountain Feist owners keep their dogs inside their home and live with them 24/7 except when hunting.